I was nicely surprised last week when went to deposit couple checks in an Bank of America ATM. I was looking for the envelope and asking my husband if he had a calculator or something to do the addition of the checks values and he said: you don't need that! just insert the checks one by one and they'll be scanned. And so it was, I inserted the first check and got a very clean scan image in the ATM screen. It showed the amount in the check in the screen and it asked for confirmation. Same thing with the other two checks and boom! I was done! It's one of these areas that didn't change much in a long time. Now, with a simple idea and a little more technology it is totally improved for all the parts. The client is surely happy with no envelope and no math involved. The bank and the client have all the security of their exact check being already in the system. Although I could not see the deposit scan online, I guess that will come soon. I just learned in the web that other banks, such as Wells Fargo, are doing it too. While I was reading and I found out there's one company that allows to scan checks and "deposit" them through the internet ... That sounds interesting too, although I'm not sure security wise this is ready for prime time. Talking about security, Bank of America also has an innovation in the area of website login securtity. They require the login id first. Then, they send you to a second screen that will bring a picture that is associated with the login account. 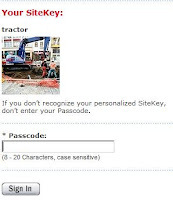 If you recognize the picture you know you can login safely as there's no phishing involed. If you don't see your pic something is wrong, do not login. So, for a while until we get to a more personalized level of phishing this works great. I wish they had something like that in Discount Bank here in Mdeo. They have this thing that claims to scans the code at the check's edge (which holds the entire check info), but it never manages to read my checks so I have to input that very long code manually and the amount too... very frustating. Yahoo has the "anti phishing picture" thing too since quite a while and it's awsome.